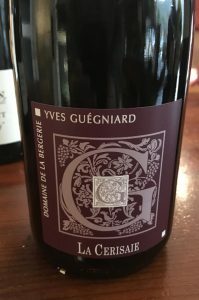 2017 Domaine de la Bergerie, Anjou Rouge “La Cerisaie” by Yves Guegniard, Loire Valley, France. Yves Guegniard’s Domaine de la Bergerie, a Loire Valley estate, lies on the terroirs of Anjou, at the eastern end of the Armorican massive. It sits on the schist bedrock of Anjou, and Bergerie’s vineyard site is about 36 hectares, benefiting from a mix of varied soils and from the mildness of the oceanic climate that allows a fresh style and an array of varietals from classic Cabernet Franc and Chenin Blanc to the rare local Grolleau, Plus as is the case in Anjou they have a small percentage of Cabernet Sauvignon as well, they craft Reds, Whites, Rosé and a lovely Sparkling Crémant de Loire. These value priced wines offer tons of personality, refinement and pleasure that, in a lighter and transparent way, highlight the region’s unique terroir. I’ve been following this Domaine for a few years now, and I adore all the wines from this estate, the are just pure examples and are quality offering with nice packaging, especially good is their Brut Crémant de Loire with it’s polished form, lively mousse and regal brioche notes, as well as this killer bargain Anjou Rouge, it’s a clean juicy wine without rough edges or harsh chewy tannin, focused more on expressive youthful fruit. Yves along with his daughter Anne crafted this bright and quaffable Anjou Rouge from about 80% Cabernet Franc and 20% Cabernet Sauvignon, it is fresh in style and drinks easily with clean and vibrant detail, pretty floral tones and less aggressive green or bell pepper notes showing crushed violets, cinnamon stick, mineral and stony elements with a core of blackberry, plum and cherry fruits with that hint of tell tale Loire Valley Cabernet Franc grilled bell pepper, as well as a lingering racy currant and anise. The grapes were vinified de-stemmed and separate by varietal with about a 15 day maceration and primary ferment before being raised in tank or cuve for about 9 months, all to allow crisp detail and a sense of place to show through. This dark garnet hued La Cerisaie is styled in a way that allows early enjoyment, but with substance, it’s medium body and complexity makes for a wine that way over performs for the asking price, it’s great as Bistro or house red and it’s remarkably flexible in the same way a Cotes du Rhone or Beaujolais Villages are. This is a drink now Cab Franc from Domaine de la Bergerie, with soft tannins, it can be served with a slight chill for warm days or stand up to more robust cuisine too, it should age nicely as well, when it loses some of its fruit and gains a touch of earthiness, though best over the next 3 to 5 years.